Free plans for an old fashioned mission style lamp and shade. This is an easily constructed library light stand in the traditional mission style. Click here for detailed mission lamp and shade plans 1. Click here for detailed project plans 2. Square up a piece of white oak so that it shall have a width and thickness of 1-3/4 in. with a length of 13 in. Square up two pieces of the same kind of material to the same width and thickness, but with a length of 12 in. each. Square up two pieces to a width and length of 3 in. each with a thickness of 1-1/8 in. You will also need one piece 1-3/4 in. square and 40 in. long, two pieces 1-1/8 in. thick and 3 in. square, all planed and sandpapered on all surfaces. 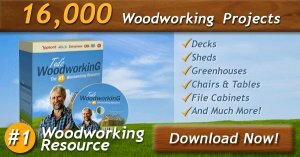 The long piece can then be cut at home to the lengths specified above. The 13-in. piece is for the upright and should have a 1/2-in. hole bored the full length through the center. If the bit is not long enough to reach entirely through, bore from each end, then use a red-hot iron to finish. This hole is for the electric wire or gas pipe if gas is used. The two pieces for the base are alike except the groove of one is cut from the top and of the other from the under side, as shown. Shape the under sides first. This can best be done by placing the two pieces in a vise, under sides together, and boring two holes with a 1-in. bit. The center of each hole will be 2-1/2 in. from either end and in the crack between the pieces. The pieces can then be taken out, lines gauged on each side of each, and the wood between the holes removed with turning saw and scraper steel. The width of the grooves must be determined by laying one piece upon the other; a try-square should be used to square the lines across the pieces; however, gauge for depth, gauging both pieces from their top surfaces. Chisel out the grooves and round off the corners as shown in the sketch, using a 3/4-in. radius. These parts may be put together and fastened to the upright by means of two long screws from the under side, placed to either side of the 1/2-in. hole. This hole must be continued through the pieces forming the base. The braces are easiest made by taking the two pieces which were planed to 1-1/8 in. thick and 3 in. square and drawing a diagonal on each. Find the middle of this diagonal by drawing the central portion of the other diagonal; at this point place the spur of the bit and bore a 1-in. hole in each block. Saw the two blocks apart, sawing along a diagonal of each. Plane the surfaces on the saw cut smooth and sandpaper the curve made by the bit. Fasten the braces in place by means of roundhead blued screws. To make a shade such as is shown in the illustration is rather difficult. The shade is made of wood glued up and has art glass fitted in rabbets cut on the inner edges. Such shades can be purchased ready to attach. The sketch shows one method of attaching. Four small pieces of strap iron are bent to the shape shown and fastened to the four sides of the upright. Electric globes—two, three or four may be attached as shown. 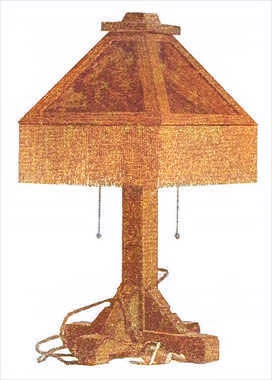 The metal shade as shown in the sketch is a "layout" for a copper or brass shade of a size suitable for this particular lamp. Such shades are frequently made from one piece of sheet metal and designs are pierced in them as suggested in the "layout." This piercing is done by driving the point of a nail through the metal from the under side before the parts are soldered or riveted together. If the parts are to be riveted, enough additional metal must be left on the last panel to allow for a lap. No lap is needed when joints are soldered. A better way, and one which will permit the use of heavier metal, is to cut each side of the shade separately and fasten them together by riveting a piece of metal over each joint. The shape of this piece can be made so as to accentuate the rivet heads and thus give a pleasing effect. For art-glass the metal panels are cut out, the glass is inserted from the under side and held in place by small clips soldered to the frame of the shade. Pleasing effects are obtained by using one kind of metal, as brass, and reinforcing and riveting with another metal, such as copper.